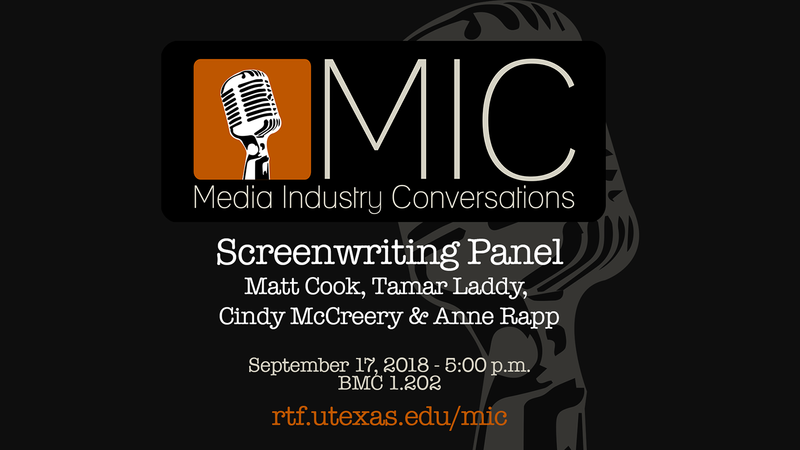 When: Monday, September 17, 2018 - 5-6:15 p.m.
Matt Cook (RTF BS ‘08, Patriots Day), Tamar Laddy (RTF Lecturer, Pretty Little Liars), Cindy McCreery (RTF Associate Professor, Haven), and Anne Rapp (Cookie’s Fortune) discussed their career trajectories, the scope of their work, and their views on the current state of the film and TV industries. Matt Cook is an accomplished screenwriter, director, and producer of various studio and independent films and television, as well as head of Hazard Pay Productions. His work includes The Duel, Triple Nine, and Patriots Day. Both The Duel (formerly known as By Way of Helena, 2010) and Triple Nine (2012) made the top 10 of The Black List. Cook broke into the industry in 2009 and has since written for Warner Bros, Fox, New Regency, DreamWorks, Sony, and CBS Films. He is currently developing/writing several projects, including Apostle Paul (with Hugh Jackman, Matt Damon, Ben Affleck producing) at Warner Bros, writing/executive producing Matterhorn: A Novel of the Vietnam War with director Peter Berg as a mini-series at HBO, and co-writing/executive producing a (not so) futuristic political drama with Ed Burns (co-creator of The Wire) for Studio 8. Cook served two combat tours in Iraq with the prestigious 1st Battalion, 187th Infantry (Rakkasans) and has written several articles for Texas Monthly about his experiences. He also served as a correspondent in Afghanistan in 2012. Cook was raised in the tiny three stoplight town of Castroville, Texas, and attended the University of Texas at Austin. He graduated with an RTF BS in 2008. Tamar Laddy is a television writer living in Austin, Texas. She most recently served as Story Editor on The CW show Hart of Dixie, and previously staffed on the ABC Family dramas Pretty Little Liars and The Lying Game. Her credits also include four episodes of General Hospital: Night Shift and the accompanying online series Night Shift: Claire & Kyle, nominated by TV Guide Canada as Outstanding Soap-Related Webisode Series. An alumna of Warner Bros. Television Writers’ Workshop, Tamar is a member of the Writers Guild of America. She holds an MFA in film and television producing from USC’s School of Cinematic Arts and a BA in geology from Princeton University. Anne Rapp is a writer and ex-script supervisor in the movie industry who worked on more than 60 feature films, beginning with Tender Mercies in 1981 and ending with the HBO TV series Westworld. She has worked with many acclaimed directors including Jake Kasdan, Billy Bob Thornton, Judd Apatow, Harold Ramis, Ken Kwapis, Jonathan Nolan, Lawrence Kasdan, Sydney Pollack, Robert Benton, Bruce Beresford, Steven Spielberg, Robert Zemekis, David Mamet, Rob Reiner, Bill Forsythe, Ivan Reitman and Tom Hanks. She began writing short stories which led to a job writing for Robert Altman who directed two of her original screenplays, Cookie’s Fortune and Dr. T and the Women and a television episode written for the ABC series Gun entitled “All the President’s Women.” The screenplay for Cookie’s Fortune earned Anne an Independent Spirit Award nomination as well as an Edgar Allen Poe nomination. She wrote a television special for CMT, a live Texas music variety show called Stars over Texas hosted by Ray Benson of Asleep at the Wheel and featuring Dolly Parton and Vince Gill, and she later teamed with Benson again and wrote the musical A Ride With Bob, a stage performance about the life and legacy of the western swing great Bob Wills. It ran for eight years. Anne has also written scripts that are in development for Alison Eastwood, Whoopi Goldberg and Dana Kuznetkoff, and has several of her own original scripts in development as well. She is currently producing and directing a documentary about the life and legacy of Pulitzer Prize winning playwright and two-time Oscar winner, Horton Foote. She has published short stories and essays, and has twice served as visiting professor of screenwriting at the Michener Center for Writers, the graduate writing program at University of Texas. She currently lives in Austin, Texas.